Brand new novel, Blake's 7: Uprising will be released in January 2019. In an exclusive Big Finish interview we chat to writer, Christopher Cooper, who told us about being a sci-fi head and why he thinks Gan is such a great character. Out for release in January 2019 is Blake’s 7: Uprising by Christopher Cooper. This brand new Blake’s 7 novel will be available in hardback, ebook and as an audiobook read by Stephen Greif. We interviewed the author of this novel (as well as many other stories), Christopher Cooper. Paddy Freeland, marketing executive at Big Finish (PF): Hi Chris! Thanks for speaking to us today. What’s your history with Blake’s 7, when did you first hear of it? Christopher Cooper (CC): I watched it from the very beginning – it was 1978 when it started so… I’m older than I’d like to admit – and from the first episode I was hooked. The thing is, when you watch it as a nine year-old, you think it’s about space and excitement, but when you watch it as an adult there’s this story about framing someone for child molestation, layers of political intrigue, murder… I didn’t cotton on to any of that when I was nine! PF: I was re-watching the Rumours of Death episode recently, and there were so many complicated emotions generated by it – Avon leaving his interrogator on a planet with a loaded gun, for example, but when you’re nine you just think, Wow what a cool show this is! CC: It’s heavy stuff for kids to understand, but I enjoyed it. It may have informed my cynical world view. PF: I think you have to be a little bit of a cynic after a dark episode of Blake’s 7! CC: You can’t help it. I came to the show having grown up with Thunderbirds, Doctor Who, Star Trek, Star Wars... I was completely a sci-fi head and totally prepared for the world of Blake’s 7, and I followed it all the way through. I cried at the end of series 1 when the Liberator blew up, I couldn’t understand what was going on! BF: It’s an incredible cliffhanger. CC: And you don’t expect it at all. PF: It’s a show where there are no rules – unlike Doctor Who. The death count is so high, the cast changes... anything can happen in the world of Blake’s 7, and quite often it does! CC: It can be quite weird and ethereal at times. PF: What’s your history with Big Finish, how did writing this novel come about? I’ve also written a couple of Torchwood episodes for BF production legends Scott Handcock and James Goss, both of whom are fantastic. And then John Ainsworth kindly brought me into the Blake’s 7 world. I’d been working with Cavan Scott, who was involved with some comics I was editing for Titan Comics. We got chatting about Blake’s 7 and he put me in contact with John. That led to two audio adventures, and then this novel, which was a really exciting opportunity to be offered. PF: What’s the difference between undertaking an audio drama with more of a traditional script, and a whole novel? Is it a different process? CC: Yes, it’s different every time. The work on Torchwood has also been different to Doctor Who which is different to Blake’s 7, with a different producer and script editor for each. Writing a novel is more thought-intensive than an audio. I find I almost become the character I’m writing about, but when writing dialogue for audio you flit between people. When writing a book it’s important to keep the focus on one character’s perspective, so you can end up in a character’s headspace for a couple of days as you’re working through a chapter. In that way it’s very different. PF: And does that makes it more enjoyable? CC: I enjoy both, but I think the frustrated actor in me gets more of a go in a novel. Actors bring something of themselves to their characters, they bring extra sparkle, and you don’t have that when writing a novel. It’s just the voices in your head that create the characters. It’s all on you to capture a character’s essence. PF: The joy of Blake's 7 is that the characters are rich and complex, and they’re all so different, you can get completely immersed in the novel format. CC: And I’ve been with the characters for a while. 40 odd years! I was so into the world of Blake’s 7 I was happy to spend 50 quid on one feature length story cobbled together from a couple of episodes when the BBC Video VHS tapes first came out, just to see it again. The voices of these characters never left me, especially Vila, he’s my favourite to write for. PF: I always find Vila quite a different character from the rest, he’s very much an outsider. He’s always cracking jokes but doesn’t want to be involved in the action. CC: That's what resonated with me as a kid. I identified with Vila. His reactions to these situations seem the most real. The heroes, Avon and Blake, are so much more forceful and in charge… I’d be more likley to think, ‘There’s someone shooting at me, I’d like to run away.’ That’s why Vila always works for me. PF: I’ve always wanted to be Servalan. CC: Of course, as you should, because she’s absolutely fantastic. PF: Blake’s 7 would be incredibly difficult to remake because she would be nigh on impossible to recast. CC: If you could remake it at all! Could you sell a character like that today? She’s so... big! With modern drama always striving for a gritty realism, could you go that big? It would become a much grittier show, and it was pretty gritty then, but imagine it being desaturated now, with grimy colours… could you have glorious Servalan wandering through in a flowing white dress?! PF: With the greatest costume budget of all time! CC: Stephen Grief, who reads the audio book version, suggested dedicating his reading to Jacqueline Pearce, which I think is a wonderful idea. And to have Travis reading the book is something I’m also very happy about. PF: When is Uprising set? CC: Around the beginning of the second TV series, between the episodes Shadow and Weapon. After the Liberator wasn’t blown up at the end of series 1, they’ve had some more adventures… There is a specific reason for its placement. I really wanted to write with the original crew, before Gan’s demise. It’s very much a book celebrating the 40th anniversary. PF: And why Gan? He’s a very interesting character. CC: Yes, and very under-served in the TV show. I wanted to add more depth to him, and talk about his neural inhibitor. I wanted to give him the storylines I feel he missed. Everyone else got the funny lines and he always seemed left out. PF: He was always the muscle, but (and I could be wrong) Blake’s 7 was one of the first shows to give that breed of character more layers. He’s a human, he has his own motives, his own reasons… so when he dies it feels like a missed opportunity. CC: Exactly, you feel cheated. And of course he’s one of the cast that is no longer with us. So, in terms of writing an audio for Big Finish there are characters that you can’t write for without recasting the actor. So I wanted to write for Blake and Gan. That first era of Blake’s 7 is my era. I hope I’ve done it justice! Thanks Chris. We won’t go into any more detail as we don’t want to give any spoilers away! 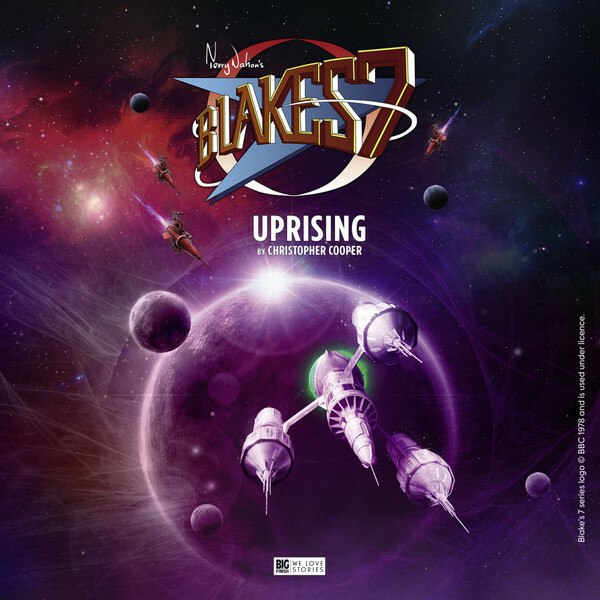 Blake's 7: Uprising will be available in January 2019 on hardback at £16.99, as an online copy at £12.99 and on audiobook at £9.99.